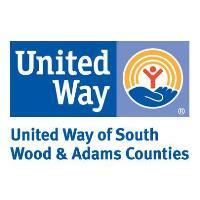 WISCONSIN RAPIDS, WI – United Way of South Wood & Adams Counties will be holding its 2018 Annual Meeting on Wednesday, February 6th, 2019 at River Cities Bank (lower level conference room). The meeting will be held at 5:00pm; the public is welcome to attend. Agenda items include: The Year in Review, Election of 2019 Officers, Nomination and Election of Incoming Directors and One Year Appointments. The 2018 Annual Reports will also be distributed and made available online the following day. United Way thanks River Cities Bank for hosting the 2018 Annual Meeting. River Cities Bank is located at 1601 Lincoln St., Wisconsin Rapids.